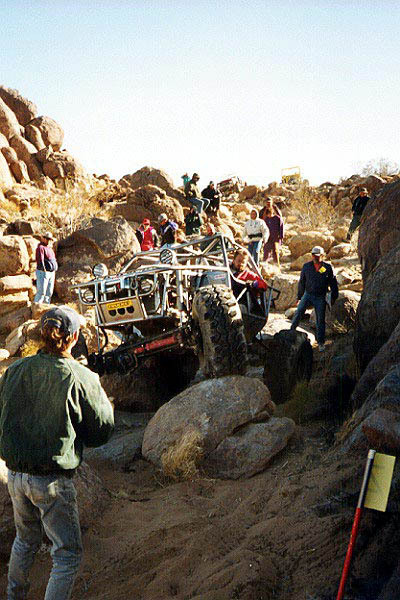 The sport of rock crawling has come along way of late. Up the trail, just ahead of our intrepid rock crawler, a new breed of helper has emerged: THE SPOTTER. As a long-time Jeeper and sometime spotter, I appreciate the value of a spotter. What is a spotter and what does one do? A spotter is another pair of eyes and a 'jeeping brain' to help the driver navigate the tricky spots on the selected route. The most important occasions are when the driver cannot see the trail, or when minute adjustments in the placement of the wheels would make the difference between go and no go, or worse. When the driver can plainly see the route with only an occasional rock or obstacle impeding progress, no spotter is needed. As the route gets more difficult, a good spotter becomes a valuable player in the mix. A good spotter is usually also a good driver. Why? Unless you experience the capabilities and eccentricities of a rig, first hand, by driving it, it's very difficult to know what to expect of those characteristics on the rocks. Choose a spotter with long tested driving skills over aunt Bessie during her first off road adventure. The spotter needs to know what the spotted vehicle can and cannot do. This means knowing at a quick glance WHAT will clear, and WHERE under the rig. A good spotter knows where to position the tires and differentials for that clearance. 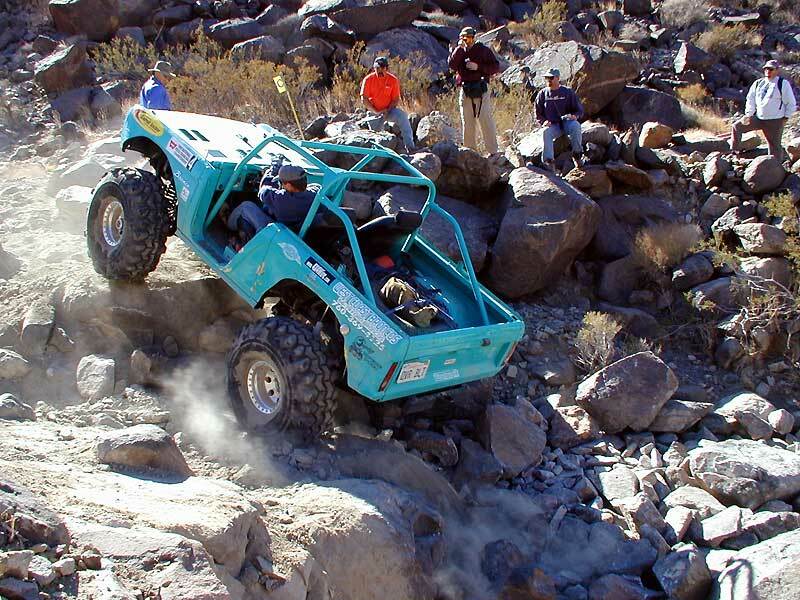 Sometimes the route requires the tires to be on top of the rocks, sometimes between, sometimes directly over. Spotters know in advance how much traction the tires have in a given situation, including the inflation (including any loss of center of gravity due to lower inflation), steepness of the obstacles, and the grip on the surface. Knowing what kind of style the driver prefers is also important. Drivers eager to use the 'Moab bump' may prefer to hit the same obstacle faster than those who like to 'tractor' over obstacles. 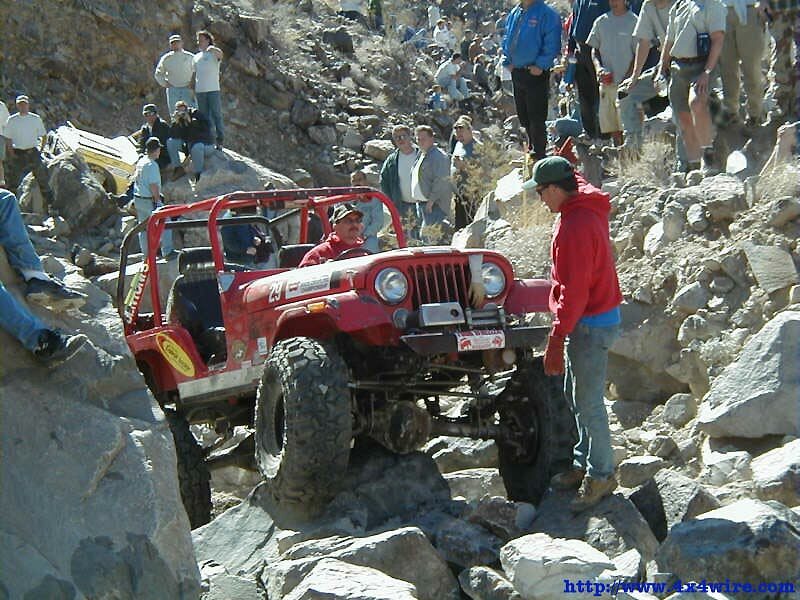 Some Jeepers have such a high degree of ability on the trail, they do not want or need a spotter. These virtuosi rely on memorizing the trail just before they go over it, taking mental snap shots of the route. If you encounter one of these talented and highly developed Jeepers, just stay out of the way, sit back and enjoy the show. Alas, most of us are not of that caliber, and must rely on someone to spot us over the really onerous areas. These may be where there is a good chance of getting out of control by sliding or rolling over, or a high degree of exposure, where you might actually go over a cliff, endo, or sustain vehicle damage or personal physical harm. Sometimes inches make a great deal of difference when driving on perilous terrain. This is where most of us DO need a spotter. 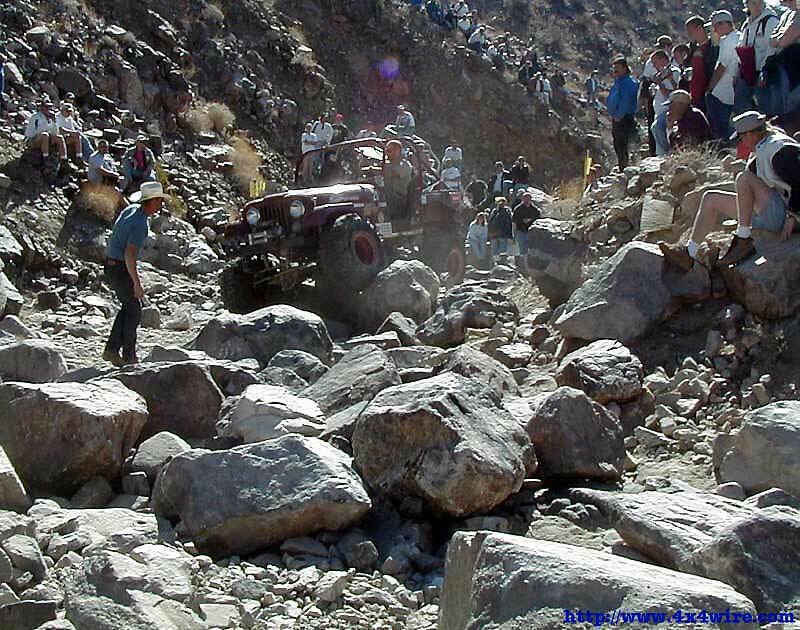 "With a large crowd gathered on the rocks, Joe Jeeper was moving through the most difficult part of the rocky route. 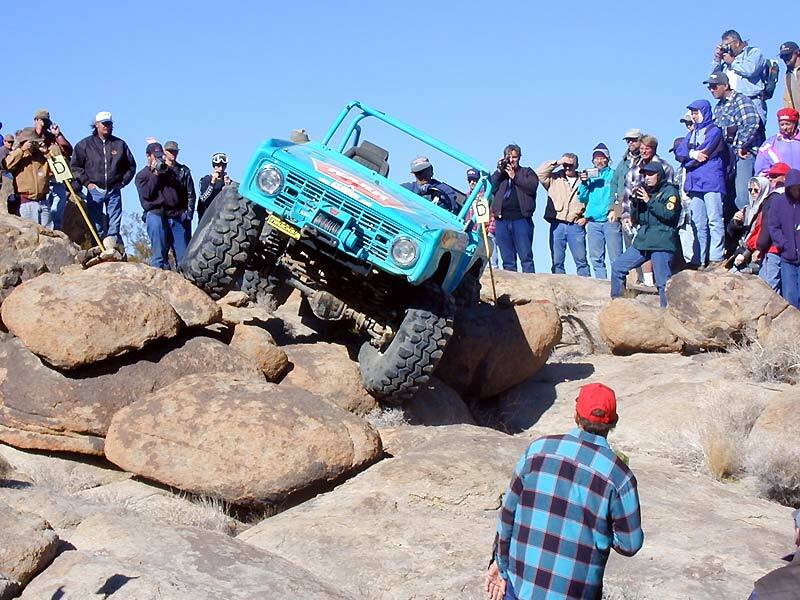 The right side of the rig was steeply side-hilling on a slab of granite. With a weight-transferring jerk, the left front wheel dropped into a hole between the rocks pulling the right rear tire into the air. The crowd gasped and started spewing forth instructions. "Stay up high", shouted one, "No, keep left and get up", snorted another. "You need some ballast, you're going over", screamed yet another. 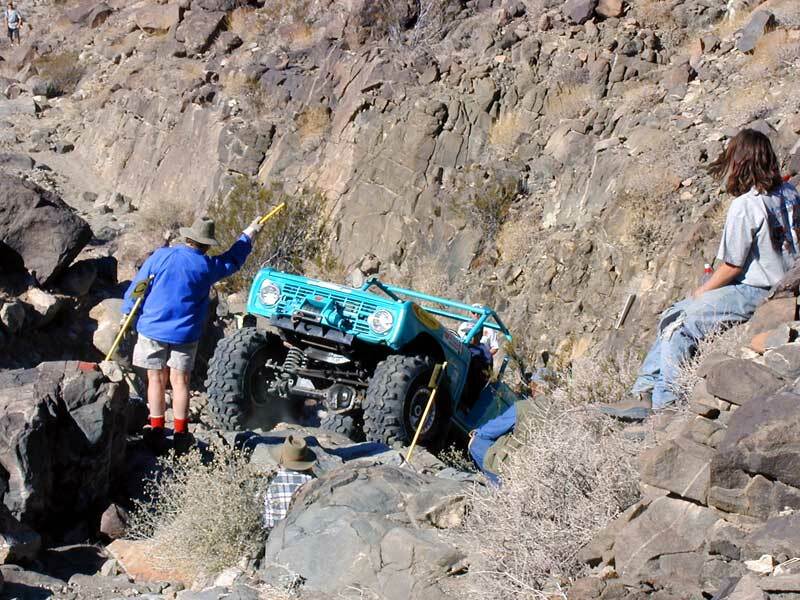 Wheels now spinning on the wet rocks, the panicked driver pulled the wheel to the right, but the jeep drifted down to the left and slowly on its side with the sickening crunch of sheet metal as all manner of tools and parts rattled out onto the ground. The frustrated driver turned off the key and banged his hands down on the steering wheel, yelling, "I can't listen to everyone at once!" If this sounds too familiar, it may be time for a little lesson in "Spotting Etiquette". In the scene described above, everyone was trying to help, but the unorganized cacophony and sometimes-unwanted advice only made it worse. The first thing to do as an interested bystander is to ask the driver if he or she wants to be spotted. You need to ask if they WANT help. Many of us overlook this obvious bit of etiquette. The knee-jerk reaction is to start shouting advice from your vantagepoint, especially when things begin to go badly. Generally, use one spotter at a time. The spotter usually stands in front, facing the vehicle, or from the side of the route where the driver can see his/her hand signals. Sometimes it is important to have an additional spotter at the rear, or where ever there is a problem area. This spotter is limited to only yelling, "Hope," "Stop," or "Wait," before the going gets to the damage stage. The second spotter only stops the proceedings and does not direct the driver in any other way. Hand signals are the best. Both driver and spotter must clearly understand any hand signals before proceeding. My favorite hand signals for casual spotting are with one hand that the driver can easily see. The spotter must continually move to a position where the driver can see his hand. FORWARD: Using the "thumb up" in the vertical position with one hand means, "move forward slowly". Slowly pivot your thumb fore to aft signaling the relative speed at which to move. If your thumb remains straight up, it means keep going in that direction, even if the wheel is turned to the side. When it's time for the spotter to move to a new location and the driver is out of danger, just motion forward and move on. TURN RIGHT OR LEFT: Leaning your thumb a little or a lot to the right or left, indicates the degree to which you would like the driver to change direction of the steering wheels. To be more insistent, you can jab your thumb more vociferously to obtain a quicker response. STOP: A flat hand held in the vertical "Stop" mode, means just that. REVERSE: If you need to have the driver back up and try again on another line, signal your intentions by waving them off and motioning for them to go back by swinging your hand toward them. Most of the time it is best to walk up and tell them this, as they will already be at a stop. This is a good time for the spotter to go to the rear of the Jeep and give "verbals" to get back to a place where the driver can try again. Now we come to the religious part. The driver must TRUST the spotter. It's like believing in God. If you don't, you may make some big mistakes. I have made these mistakes, but I have learned to trust a few spotters. My son Matt and my brother John are my favorite spotters. We communicate. We know each other's signs. We know each other's skills and tendencies. NO SIGNAL-NO MOVE, Spotter signals-I move, and I just keep looking at the spotter, not the trail, because I can't see the trail like they can. "Trust,... my brothers and sisters, trust". This puts a lot of pressure on the spotter. If you don't trust the spotter, you're on your own. If you can remember "where you are" on the trail, you may not need a spotter. However, sooner or later, people yelling instructions may distract you, or you may forget where you are. So, next time you start yelling at someone creeping over some noxious real estate, thinking you're helping him or her out; think again. Practice some of these spotting techniques yourself. You'll find a pleasant reduction in everyone's blood pressure, and hopefully a diminishing of those ugly grating metal sounds associated with a truly tough trail. Since spotting my brother John at the 1999 Warn Rock Crawling Championships in November, I have a chapter to add to this opus. The stakes were much higher in this competitive event, so we worked on refining our technique. It was important for me to think of the trail ahead and relay directional information to him, but not too much. There was a fine line between giving him too much information and not enough. Occasionally he would hang up on something I thought he should just motor over. Since the event was timed, we needed to be less casual and speedier. This meant that I needed to be farther ahead of him than usual and John needed to see the 'Joystick' easier. I used a bright yellow, cut-off broomstick handle instead of my thumb as a pointer. He could see it out of the corner of his eye without focusing, and continue. The joystick is about 10" long with a wrist strap so I could also drop it and stack rocks. 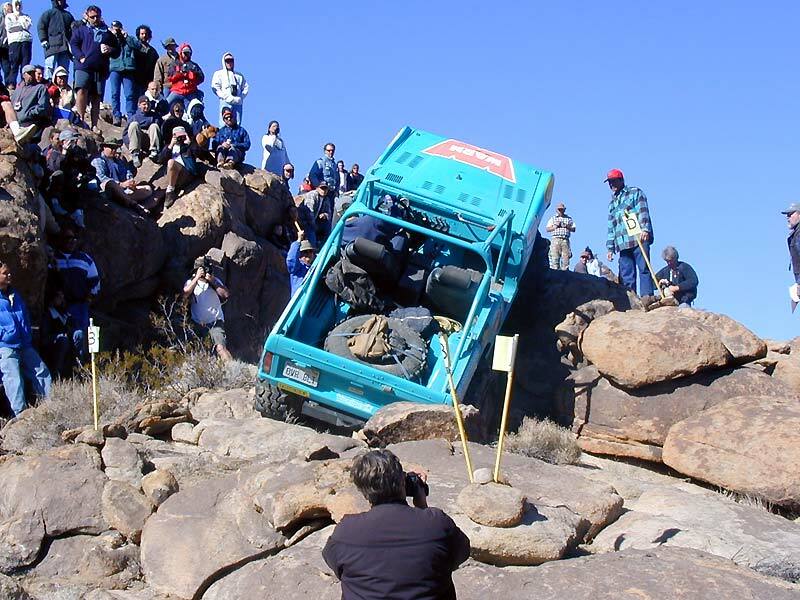 The joys of "rock surfing"
In competitive rock crawling, the spotter is also used as a 'Rock surfer', using his weight as ballast in off-camber situations. 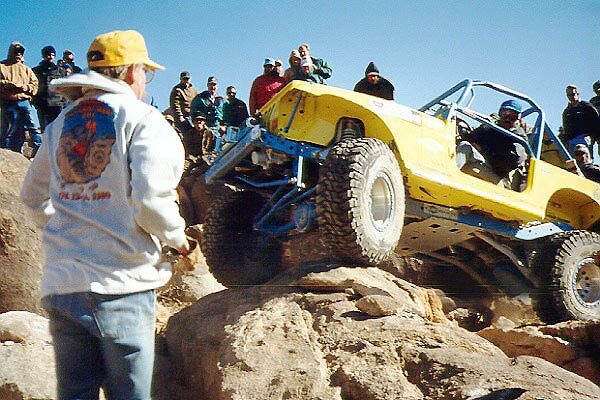 I hung eventually on every corner and out the doorways of his Bronco during the event when he needed my 200 pounds of ballast to keep his rig upright. Rock surfing was common during the event for many of the competitors. There was a wide variety of spotting styles during the WRRC. Some spotters looked more like monkeys climbing around the perimeter of the rigs, rock surfing and keeping an eye out ahead from a higher vantage point, relaying the information to the driver via VOC radios. I have joked that the ideal spotter needs to be, (1) a 20 year old college fullback that can run like a gazelle, (2) weigh 250 lbs. for rock surfing with gravity that makes a difference, and (3) have 35 years of experience.